This Mustang was ordered by Bill Maier with a 390 cubic engine, and originally delivered to Hayward Ford. Maier first built this car into a road racer, between March and June of 1968. The original motor for this effort was a Windsor-based 302, with C6FE GT40 heads and Ram Box Intake provided by Ford Motor Company via its Performance Manager, Tom Senter. In the Fall of 1969, a Holman-Moody sourced Boss 302 was installed and raced. For IMSA competition, two former Formula 5000 engines with Weber carburetion were purchased from Peter Brock in 1974. By 1969, Bill Maier began entering West Coast SCCA Trans-Am races, and continued to do so until 1971. Bill Maier began to produce parts for other Mustangs and Shelbys in 1970, and always raced and developed parts for the Ford brand. 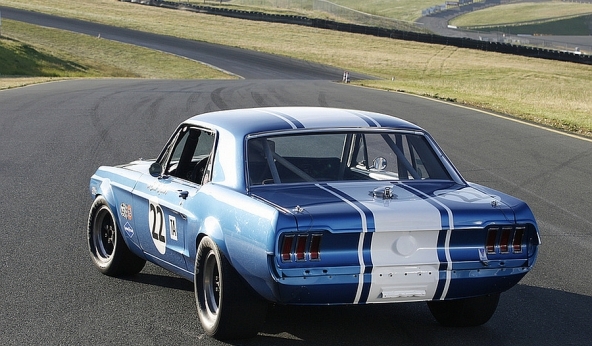 This 1968 Mustang became more developed as the years progressed, with Maier running dry-deck Boss 302s from Bud Moore for several years, and eventually winning the San Francisco SCCA Regional Championship and Northern Pacific SCCA Divisional Championship for A-Sedan in 1976.